The Battle of Kaer Morhen is one of the toughest fights in The Witcher 3: Wild Hunt. I hope you’re prepared. Next up: Blood on the Battlefield, or back to The Witcher 3: Act Two. If present, Hjalmar, Vigi and Falon don’t have anything new to say. If present, Zoltan can craft low-level gear for you – get all your stuff repaired now. If present, Ermion is discussing a new gas trap with Vesemir. When they’ve finished you can talk to them about it, and suggest patching up the walls a little. 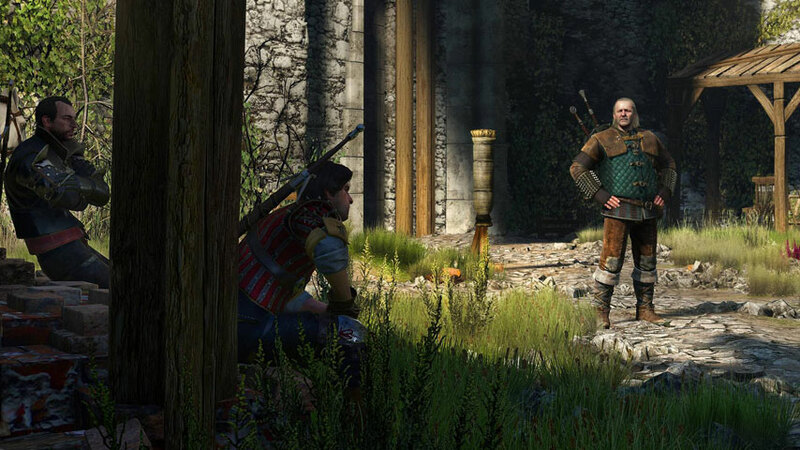 If Ermion is not present, Vesemir is alone in this courtyard. In either case, loot the chest near the grindstone. If Roche and Ves are present, Lambert is fixing a ballista. He doesn’t have anything to say. If Roche, Ves and Letho are present, Eskel is meditating alone next to the steps. If Roche and Ves are present but Letho is not, Roche and Ves are close to where Eskel is meditating. If Roche, Ves and Letho are present, the Temerians are practicing archery and fencing in the next courtyard. Letho will interrupt your conversation with Roche and Ves. If Roche and Ves are not present, but Letho is, Eskel and Lambert are in this courtyard with Letho. Before entering the main hall, head south to speak with Ciri again. I wish there was a hug button, don’t you? If present, Keira Metz is just inside the main hall. Speak to her a second time to access her alchemy shop. Interact with her illusion bubble to annoy her a bit, just for fun. When you’re ready, head to the centre of the main hall to address your combatants. You can say whatever you like at the first choice, and you have to say everything after that – until you must make two decisions, one about the lab and one about the workshop. SPOILER ALERT: Skip past the italics if you don’t want to know the consequences of these choices. If you choose potions, you’ll get a Superior Swallow. As an added bonus, if you completed the sidequest Following the Thread, you and Lambert both receive a Fortified Rafard’s Decoction. If you choose traps, some members of the Hunt will be killed by the environment during the battle. If you choose to repair the wall, there will be one less wave of enemies to face in the battle. If you choose the clear the rubble to the armory, all the witchers will do increased damage, and you’ll receive a masterwork silver sword. The battle is about to start, so make some last minute preparations: make a backup save. Ensure all your best gear is equipped. Enhance your sword and armour at the table and grindstone. Search Kaer Morhen for alchemy ingredients and make any bombs and oils you can. Kit yourself out with Elemental Oil (silver blade, for Hounds) and Hanged Man’s Venom (steel blade, for Huntsmen). When the battle actually kicks off, speed is of the essence – I recommend reading ahead to get a feel for how things are going to go down, as well as pausing to refer back to this guide if required. Talk to Ciri and remind her not to die, then head out the main entrance to meet Lambert and kick things off. Your goal is to close the rifts. Don’t bother fighting anyone until all three are closed; just run away. Use Yrden on the rifts to preserve your bombs if you can; you won’t get many chances to replenish them and may need them for actual fights. You can’t fall in Roche’s pits, don’t worry. Their existence just means fewer enemies to worry about here. As Ciri, you can make a limited time decision to fight. Use Ciri’s special evade skill (dodge and roll) to move faster towards your goal – Triss. Use Ciri’s new special attack (Charge, hold down the heavy attack button) to clear enemies quickly and safely, since she can’t refill her health with food like Geralt does. Clear the enemies around Triss to complete this stage. Gallop back to the keep; if you pause, you may be killed in a single hit from the fireballs. Battle the enemies in the courtyard until Vesemir tells you to close the gate. Run to the opposite end of the courtyard from the entrance so you can climb up onto the battlements, then run around the wall, killing the foes attacking Vesemir (and Ermion, if he’s there) to reach the lever. Pull the lever. Lambert will now be attacked, with varying results depending on your actions to date. Vesemir will call for a retreat to the central courtyard, so off you go. In the next area, your first priority is to close the portals using bombs or Yrden. Kill off the remaining enemies. Use Igni to ignite barrels for good times, but make sure you’re at a distance when they blow. Roche and Ves will assist if present. The central gate is locked tight and Eskel is nowhere to be found so head around to Triss, closing another portal on the way. As Ciri, battle to rescue Eskel. You only face Hounds and Huntsmen. You’ll be prompted to open the gate. Kill the two groups of Hounds between you and the gate mechanism, then interact with it to let your friends in. As Geralt, run to either side of the main hall and close the portals there, then repeat on the other side. Closing the portals is your first priority – not fighting enemies. Hjalmar will help you, if present. If you chose not to repair the wall, you have to close a third wave of portals. Run to the indicated location and do so. Triss will call to you that the main gate is about to be breached; head back there to end the battle and the mission. You can’t do anything to prevent what happens in the ensuing cutscenes; I’m sorry. Blood on the Battlefield begins automatically.